Just the other night i was out for a walk after dinner with my mom, and saw this beautiful Sunflower in my own garden gazing at the hallozen light on street and admiring its resemblence with its lover Sun. That made me wonder and realize "Why is Rose the flower tat represents love??" bz at the end of the day Sunflower's passes every test of being the mark for a true beloved.
" what really love should be like "
and for them "Love is TRULY Life"
- In days when you are about to propose somebody for the 1st time and you have butterflies in your stomach fear of rejection and you still just want even after a NO, he/she still remains a friend then Gift Sunflowers - why so?? yellow is a very happy colour and ofcourse the colour of friendship so even if your hidden love says NO to you he / she will still be happy about your thoughfullness about Sunflowers and when you reveal its meaning will be something very impressive to him/her....why not give it a try? 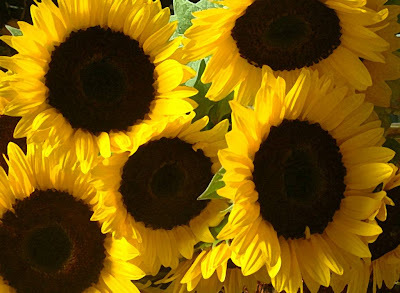 - ofcourse most important Sunflowers Fit in your budget and cheaper than roses :) you dont need to hunt for some good breed sunflowers just a few of them is enough to make someone feel good.